Q. How long have you been sculpting? Q. What led you to take it up? A. Growing up, art was an essential part of our lives. My mother, Eleanor, was a portrait painter, so is my sister, Susan, and her daughter, Claire. As a sculptor I can directly expresses the interplay between height, width and depth. And I get to take advantage of my strong tactile sense. My primary tools are clay, natural light and my hands. After graduating from NC State I was operating a bike import and retail business in five cities. The Art Students’ League was half way between my apartment in Greenwich Village, and our Manhattan store. I started sketch classes with Robert Beverly Hale, added his artistic anatomy, and finally focused on sculpture with Sidney Simon, Ned Kaz, and José de Creft. For ten years I studied, showed, and monitored at the League. Q. So New York City was where you got started? A. Yes. New York City was, and still is, a treasure trove of important sculpture: The Brooklyn Museum of Art, The J.B. Cantor Museum held the Rodin Collection, The Met., MOma, The Whitney Museum, plus the private galleries with their changing exhibitions. As League instructors taught me to see with a sculptor’s eye, I grew in appreciation for the unique visions of sculptors whose works were on display throughout the city. We are fortunate to now live in another city that encourages the arts, along with exploration, and discovery in many forms. In fact Nashville is rather like OZ for bright, talented people. To musicians Nashville is Music City. To educators, and students, Nashville is the Athens of the South. To immigrants Nashville is a haven. To physicians, researchers, and other health care professionals, Nashville is a major center for healing. This diverse cultural mix fuels artists. The Nashville Association of Art Dealers (naAd) helps us find exhibitions in the local galleries and museums. The Nashville Arts Magazine gives us valuable information about selected artists, and art-related events. And the Tennessee Art League welcomes visual artists into its artist-run organization. The climate of Nashville in its broadest sense includes four beautiful seasons, southern hospitality, and continually emerging artistic opportunities. Q. When you started did you do all of your sculpting at the League? A. No, that wouldn’t have worked. They locked up the place at night. 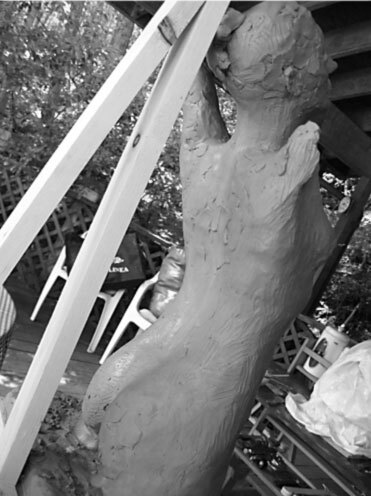 I am often sculpting as the sun comes up, and when the sun goes down. While we lived in Manhattan, my wife, Cynthia, and I maintained a sculpture studio on Union Square. When we moved to Orange County, N.Y. to raise our family, the lower level of our lake house was the sculpture studio. In Nashville we renovated one side of our house as a place to sculpt. 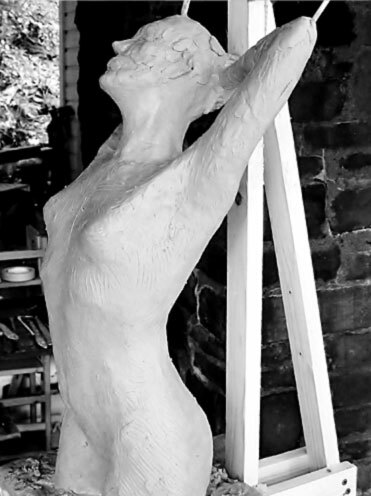 We also take advantage of a New York river house and studio for uninterrupted periods of sculpting. Q. This is a new web site. What has changed? A. There is a wonderful change for me. Until now I have been working fulltime: in the bike business, then as a high school science teacher. After 15 years of teaching chemistry, physics and other science courses, I retired in May. I can finally add that time and energy to my sculpting practice. Q. Does portrait sculpture fit with today’s busy lifestyles? A. It does, in an important way. Beyond our usual responsibilities, dealing with change itself swallows minutes to hours of our day, and, I’m sure you’ve noticed how the rate of change is accelerating. For reasons of self-preservation our brains give priority to novelty. Stable and lasting emotional connections get less focused attention. But those are memories and thoughts that create our sense of identity: looks of trust and delight on our toddler’s face; the myriad expressions our teenagers show us as they find their path in an adult world; plus the supportive, capable images of our mentors, and of our parents. The presence of a sculpted portrait helps to balance our thought patterns, subduing the incessant and trivial, while reinforcing our feelings of gratitude and fulfillment.